The Top Blogger was author Marilyn Baron. Romance Lives Forever features authors and new books. It has a blogger's FAQ page with a downloadable guide and optional interviews. Readers can follow via Google+, Networked Blogs, Linky Followers, email, an RSS feed, and there's a blog button readers and authors can grab. RLF takes up to three images per article, so authors can share previous books. The blog uses author or publisher names as tags on posts, and author Twitter handles in the titles. The site is broadcast over Triberr with a potential reach of over a million readers via its Twitter-linked network. Twitter mentions are also gathered in several Paper.li ezines, giving the author additional opportunities for promotion. The Romance Lives Forever Paper.li ezine features guest authors on its front page every day. Limited spots to share book covers are available. Cost is $3 per month, with discounts for covers posted for one quarter and up to one year. Covers can be changed monthly. Thank you Kayelle. This is a real honor and I love your blog. 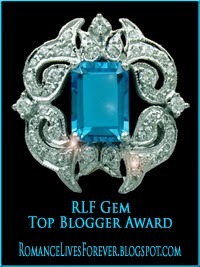 Congratulations to Marilyn and the top bloggers! Hugs to Kayelle for hostessing.